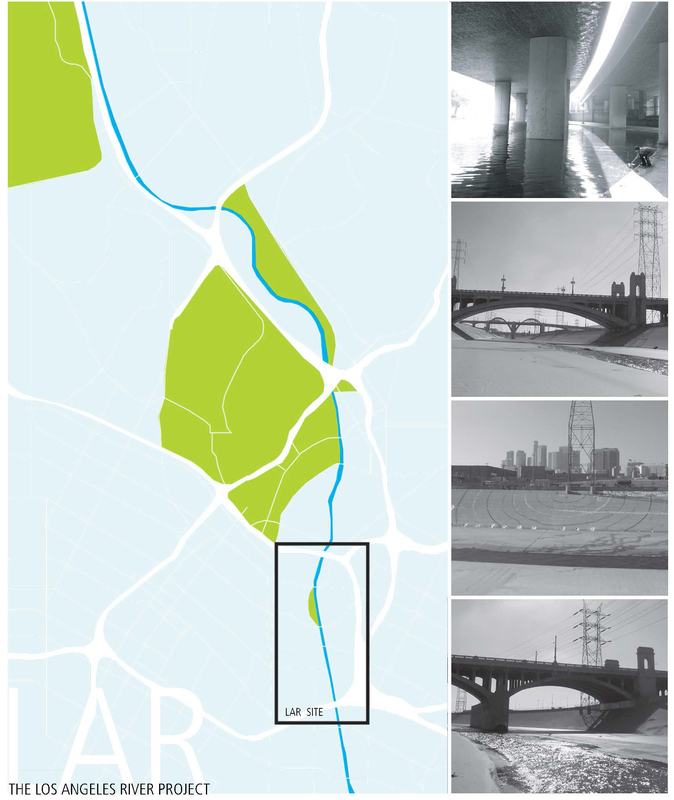 There are ample sites along the Los Angeles River that could benefit from a socio-environmental design project. It transforms from haphazard greenery to uninterrupted concrete by the time it reaches Downtown Los Angeles where it separates the Arts District from East LA. This segment of the river has the right balance of flourishing neighborhood nodes within vastly poorly functioning zones and fragmented communities to present a unique urban opportunity to encourage healthy growth. The project explores the activity that might develop when community retail on the East and an environmental wetland park on the West replace the existing industrial zoning along the riverbanks. 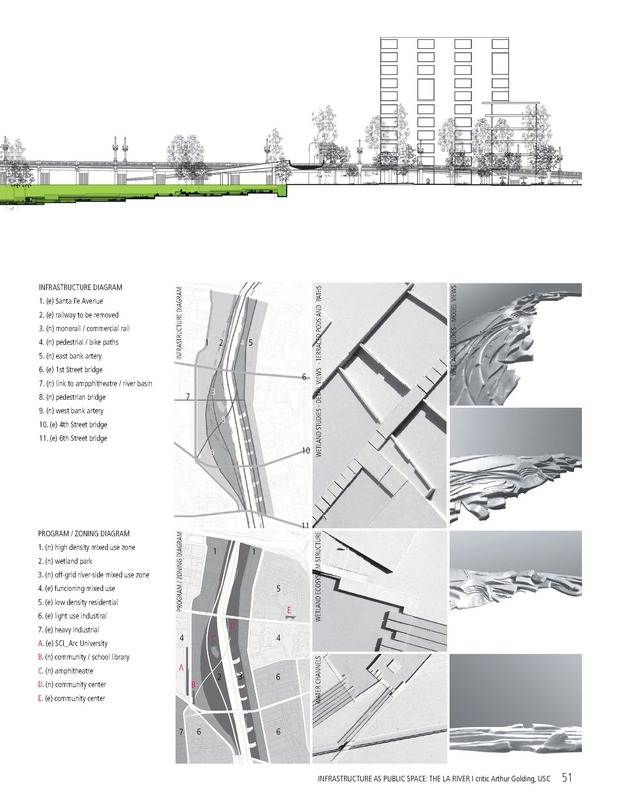 The project proposes to transform the land currently dedicated to Amtrak maintenance into a constructed wetland where new soft bottom incisions into the existing concrete act as diverting channels to convey a certain percentage of the river’s water through acres of distinct, terraced pods that will create a milieu of ecosystems within the larger wetland ensemble. 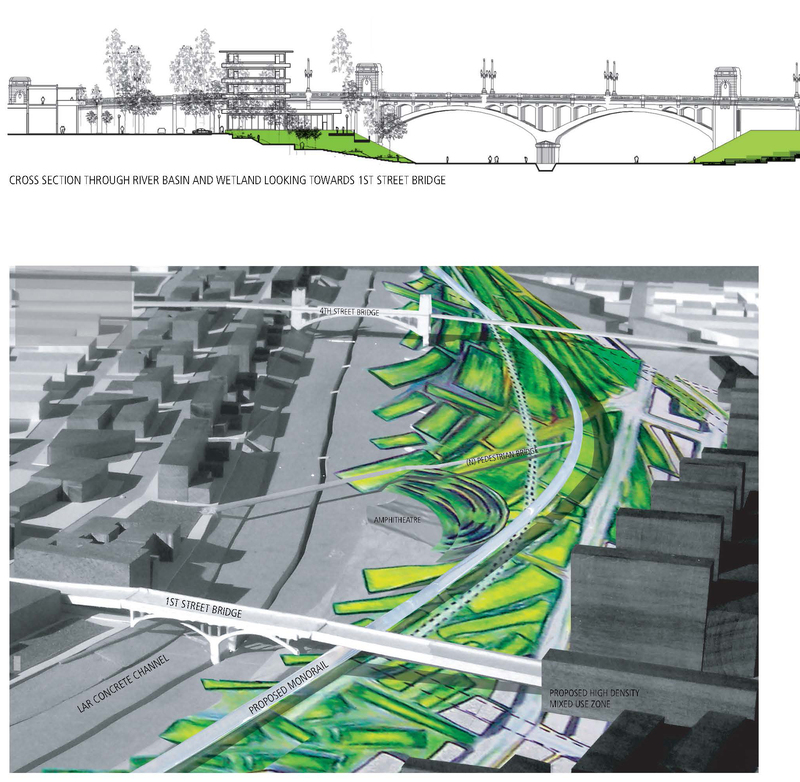 The proposed wetland stretches from the First Street Bridge to the Fourth Street Bridge. Between these historic links, the wetland gently slopes down as a series of cascading terraces, ecosystems, pods and plateaus that intertwine with pedestrian paths and bridges to create a floury of activity at all scales – human and microscopic – that guide the community of the Arts District into the LA River basin. Unlike a strictly natural wetland, the project strives to use both natural and manmade elements to create a setting symbiotically beneficial for social and environmental needs. The manmade elements include the existing concrete of the river basin and the proposed infrastructure, specifically the monorail system and pedestrian and bike paths and bridges. These elements combine to create a unique environment where activity occurs within the river basin as well as along its banks. Paradoxically, the relative dry nature of the LA River achieves a connection between communities that would be impossible with a traditional abundant watercourse.